The series is set against the backdrop of the up-market private hospital, Binneland Clinic in Pretoria. The stories revolve around the lives of a dedicated group of professionals committed to healing the suffering of their patients. Binnelanders is a story of real people living real lives until a ghost from the past threatens to destroy everything they love. Zieg Combrink is a successful doctor and part-owner of an up-market private clinic. Surrounded at home and work by a bevy of adoring and competing women, Zieg seems to have everything a man could want, until his life takes an unexpected turn. First a patient of many years dies, leaving Zieg with a moral dilemma. Then a new nurse arrives at the clinic and appears determined to sabotage him professionally and personally. When Zieg realises what she is up to he confronts her, only to discover that she suspects him of something terrible. Zieg knows he's innocent, but has trouble convincing everyone else, leaving his straight-talking wife Karla to try to piece together the sinister events of the past in a desperate attempt to save her family. The sixth season featured a raft of changes to the show, not least of which its title: Binnelanders officially becomes Binneland Sub Judice. The show also became an hour in length - the first South Africa daily drama to do so. To accommodate the new length of episodes, this season introduced an arch-rival to the Binneland Clinic: a team of legal eagles known as RPK (Rossouw, Paulse and Knight Incorporated), whose sole aim appeared to be to take down At Koster and the clinic in a legal battle of power. Binneland was accused of dealing in the unlawful harvesting of organs by RPK, and the ensuing drama unfolded. Season 6 saw the return of a number of familiar faces including At Koster (Hans Strydom), Ingrid Louw-Koster (Michelle Botes), Stefanie Louw (Rolanda Marais), Conrad Best (Hykie Berg), Kallie Koster (Tobie Cronjé), Toeks Muller (Franci Swanepoel), Jennifer Adams (Sandi Schultz), Franz Basson (Dawid Minnaar), doctors Quinton Meyer and Tertius Jonker (Ramey Short and Reynardt Hugo), Nathan Richards (Karl Thaning), Faye Becker (Esmeralda Bihl), Pippa Venter (Nadia Valvekens), Veronica Williams (Chantelle Gertse), Elise Kruger (Lindie Stander), Daleen Oosthuizen (Desiré Manthey), Gys Eloff (Viljé Maritz) and Dylan Fourie (Carl Beukes). New characters this season included the RPK Directors Joeke Rossouw (Jana Cilliers), Warrick Paulse (Terence Bridgett) and Oliver Knight (Nick Boraine); lawyers Hannah Rossouw (Lika Berning), Michael Lennox (Antony Coleman) and Yvette Stuurman (Michelle Pienaar); article clerks Zoey Matsekwa (Maggie Benedict), Belinda "Billy" Cooper (Robyn Olivia) and Nadia Da Costa (Christl Weinbeck); Emilio Castignani (Jason Kennett), the owner of the Bistro next door to RPK; and Ulrich Moolman (Albert Pretorius), a law student who would desperately like to work for the firm, but in the meantime works as a barman at the Bistro. This season also introduced a new set and was shot in a new location. It was shot entirely in HD. After one season as a daily hour-long soap known as Binneland Sub Judice, the show reverted to a half-hour daily soap and changed names for a third time, to Binneland. The name changed from Binneland Sub Judice to reflect the removal of the legal aspect of the show that dominated last season. The law firm RPK (Rossouw, Paulse and Knight Incorporated) was written out of the show so that it once more only focused on the Binneland Cinic. Characters from RPK were still involved, with guest appearances and new storylines integrated with Binneland Clinic. Most of the Season 6 cast returned for Season 7, with the notable exclusion of Michelle Botes, who left midway through the season in 2010 to resume her role on SABC3's Isidingo. Karl Thaning also left the show. A major casting this season was the addition of former 7de Laan star Elma Postma as Bea Delport, a newbie who has difficulty being accepted by the Binneland crew. Dr. Jennifer Adams (Sandi Schultz), Dr. Franz Basson (Dawid Minnaar), Dr. Conrad Bester (Hykie Berg), Dr. Dylan Fourie (Carl Beukes), Dr. Tertius Jonker (Reynardt Hugo), Dr. At Koster (Hans Strydom), Kallie Koster (Tobie Cronjé), Suster Elise Kruger (Lindie Stander), Stefanie Malherbe (Rolanda Marais), Dr. Quinton Meyer (Ramey Short), Toeks Müller (Franci Swanepoel), Suster Daleen Oosthuizen (Desiré Manthey), Warrick Paulse (Terence Bridgett), Yvette Stuurman (Michelle Pienaar), Suster Pippa Venter (Nadia Valvekens) and Suster Veronica Williams (Chantelle Gertse). Due to the division of M-Net into two channels in April 2011 - M-Net Satellite and M-Net Terrestrial - the series was now broadcast on kykNET and M-Net Terrestrial. Season 7 thus did not air on M-Net Satellite, nor on M-Net HD. 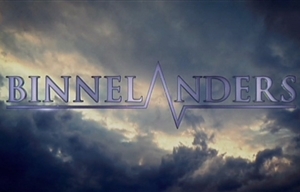 Binnelanders began in October 2005, a weekly hour-long drama. It began filming in August 2005 at the SABC's Broadcast House in Commissioner Street, Johannesburg. The first season and the first 16 episodes of the second season ran as an hour-long drama on Thursdays at 19h30, in Afrikaans only. Midway through the second season (Episode 69) the show became a daily half-hour soapie and English subtitles were introduced. The time changed to weekdays at 18h30, directly after M-Net's long-running soapie Egoli. The change in format came two months before M-Net Open Time (17h00-19h00) was closed and was designed to boost the Binnelanders audience before the pay channel lost its free-to-air viewers. Binnelanders changed to the 18h00-18h30 timeslot on Monday 6 April 2009, swapping times with Egoli, which had already set its finale date. The move was designed to get viewers used to the 18h00 timeslot before Egoli ended. The show became the first daily drama in South Africa to be an hour in length when Season 6 debuted on 5 April, 2010. It replaced Egoli in the 18h30-19h00 timeslot on weekdays when the former soap ended its 18-year run, taking over the whole hour from 18h00-19h00. From Season 6 the show was retitled Binneland Sub Judice to extend the scope of the story after becoming an hour in length - producers felt the hour would be too long to have it set exclusively in the clinic. A new legal firm - Rossouw, Paulse and Knight Incorporated (RPK) - was introduced, along with a host of new characters. The production also moved from shooting at Broadcast House to Stark Studios in Randburg, a production facility built by the Binneland producers, Elsje and Friedrich Stark. For Season 7 the show once again renamed, this time to simply Binneland, after a decision was made to drop the legal angle of the series after one season. It also reverted to a half-hour daily soap again and was removed from M-Net Satellite after the channel was split into two. Shortly before the end of Season 9 - on Monday 17 February, 2014 - the series reverted once more to Binnelanders, as the producers felt that when viewers talked about the show, they still referred to it by its original title. Season 10 premiered on kykNET on Monday 31 March 2014, at 18h30. On Monday, 6 October 2014 the show changed timeslot to weekdays at 19h30. This timeslot was retained for Season 11. The series premiered simultaneously on M-Net and DStv's kykNET channels on Thursday 13 October 2005, at 19h30. It began as a weekly hour-long drama, changed to a daily half-hour soap, became a full one-hour daily soap then reverted to a half-hour soap once more. The series aired simultaneously on M-Net and kykNET for the first six seasons. In April 2011 M-Net was split into two channels, M-Net Satellite and M-Net Terrestrial, and the show was moved to M-Net Terrestrial for Season 7, airing simultaneously on kykNET. A job offer, a resignation, a rescinding of same resignation - its all happening! Embryos become a crisis?! Also: At lands up in ICU.